There's still no clear-cut way to define class in America, because class can be defined by things like education and occupation in addition to income and net worth. 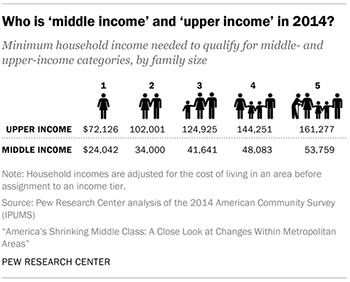 Nonetheless, Pew Research Center took a stab at defining class in a 2016 report, noting that "middle-income Americans are defined as adults whose annual household income is two-thirds to double the national median, after incomes have been adjusted for household size" while "lower-income households have incomes less than 67 percent of the median and upper-income households have incomes that are more than double the median." The national median household income was $59,039 in 2016. Pew factored in household size because smaller households require less to support the same lifestyle as larger households. Still, just because you fit into those parameters doesn't necessarily mean you will feel upper-class. Courtney Mishoe and her husband are making more than $180,000 a year to support their five-person family. Still, the suburban Georgia couple doesn't "feel wealthy," Mishoe told Todd C. Frankel of the Washington Post. Some people living in the area who earn $100,000 "are living paycheck to paycheck," the Post reports, and even families earning up to $250,000 "don't consider themselves to be high-earners." These situations illustrate how difficult it can be to avoid lifestyle creep and how a hefty paycheck doesn't always guarantee financial peace of mind. Plus, where you live matters, since median income, as well as cost of living, can vary drastically by city. No matter your income or residence, budgeting and living within your means can help you out tremendously in the long run. How much do you save each year? How does that compare to how much you should have saved at every age?